To me, the Harvey hurricane and flooding disaster feels like it was ages ago, but it’s only been about five months. Of course, for those still dealing with the aftermath, the hurricane’s catastrophic effects are clear and present every day. Harvey displaced over 30,000 people and left $125 billion in damage, a figure comparable to the 2005 Katrina storm. 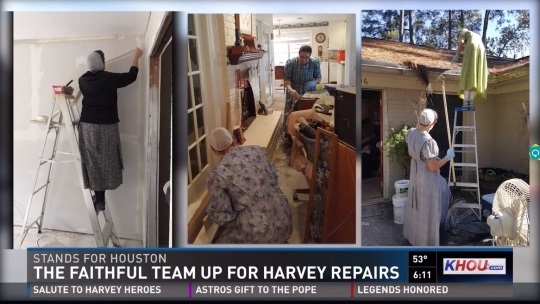 Buck, who is leading the Harvey Relief Volunteer Group for Cypress United Methodist says some Amish men first came to Houston nearly six months ago to help the community. In the last five months, about 600 Amish or Mennonite men and women have flown or driven to Houston. They’ve come from California to New York and every state in between. They’ve tackled 120 homes so far. Buck says it’s a savings of about $2,000 for each homeowner. Amish and Mennonites have a long tradition of helping out after natural disasters. Besides being appreciated by the storm victims, I think the volunteers get to have a special experience as well. Apparently they’ve become fond of Texas’ own Blue Bell ice cream, mentioned at the end of this video. Here’s hoping those still rebuilding will get all the resources they need and an accelerated return to normal life. Wonderful they are helping in Texas. Lets not forget our friends on the Island P.R. Mennonite Disaster Service (MDS) and Christian Aid Ministries (CAM)are two Mennonite/Amish organizations that many Mennonites and Amish volunteer with in disaster cleanup and rebuilding. Both of these organizations are working in Puerto Rico in disaster cleanup and rebuilding. There is also a program called CASP (Christain Alternative Service Program) for conscientious objectors, that is set up with Christian Aid Ministries (CAM). Government approved, monitored community service program where young men volunteer for 4 weeks. My son just got back from the base that is set up in Port Arthur, TX. His group consisted of 5 families/couples who served as house parents, crew leaders, administrators and 19 young men who fixed up houses, including the final clean up. Boot camp style restrictions, 2 crews per crew leader provided free labor to home owners. Anything that had to be done. Home owners provided the materials (flooring, dry wall etc.) tools and elbow grease provided by the boys. Base in a large church which got fixed up first so they could stay there. These groups come and go back to back as long as necessary in that particular area. Another CAM base is in Beaumont, Amish going there. All food, fuel, travel etc. is provided by affiliated churches and the volunteers. CASP groups also cleaned up and fixed us national parks in various areas after flooding, restoring facilities in national or recreational parks (as directed by local government agencies). It’s an awesome program and quite a sacrifice/experience for all that participate and their families who stay home without their boys. The sad part (according to my son) was that they met several home owners who were scammed out of their money by crooks who never showed up with materials they had paid for and our crews had to prove extra hard that they are for real and not robbing these poor hurricane victims. This was a great story. So many people think of the Amish in negative terms like oppressive of women, child labor, etc. This helps to show they are true Christians doing as Jesus said. This is a feel-good story, and the Amish and Mennonites are fine examples of how the rest of us can help our fellow man after disaster hits. But think about what those volunteers are giving up, about the physical labor involved, and who’s doing what to help THEM back home? The “good” keeps flowing, getting passed down from one person, one community to the other. They’re an inspiration to me, for sure. Keep it going, pay it forward! It is unpaid labor but I think that is something the Amish are used to, and I think they generally enjoy these types of trips – a good change of pace and chance to see somewhere new. Of course it’s not so easy if you are a dairy farmer to leave that behind to someone to manage, though with other types of businesses it’s generally more manageable, also you do see a lot of youth and younger people who theoretically have more flexibility participating in these projects. Regardless pay it forward is a great concept we can always use more of. There are many verses in scripture re: taking care of your neighbor. Those who help out in a time of need and crisis are spreading the Gospel, as we are commanded to do in scripture! A whole lot more of God, and a whole lot less of greed, would be a GREAT thing today! A timely message Terry, thanks for this.